The order of chicks for April 26th has been cancelled. 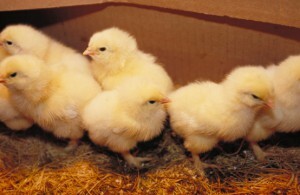 However, we have a great selection of chicks in the store today! Stop by and check out our rare breeds like Cream Brabanters, Mallard Ducks, French Guineas, & Salmon Faverolles that lay pink eggs! This entry was posted on Thursday, April 19th, 2012 at 5:13 pm	and is filed under News & Updates. You can follow any responses to this entry through the RSS 2.0 feed. Both comments and pings are currently closed.